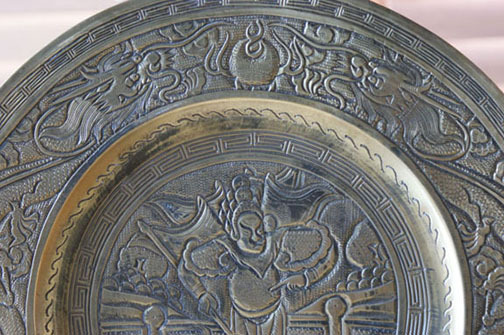 Subject:Chinese Brass Plate, Export or Genuine Period? We acquired this brass plate from my grandmother's estate in 1979. We think my great-grandfather, a ship's captain sailing from New York, NY, may have acquired it in the late 1800's or early 1900's. It looks as though someone, at some time, cleaned it with something to remove the patina. Was it a practice in the Chinese export market to "age" plates? It bears the" Da Ming Xuande Nian Zhi" mark but we have never seen a genuine mark. Does anyone know where we might lookup examples of genuine marks from the period in brass? Any information anyone could provide would be greatly appreciated. 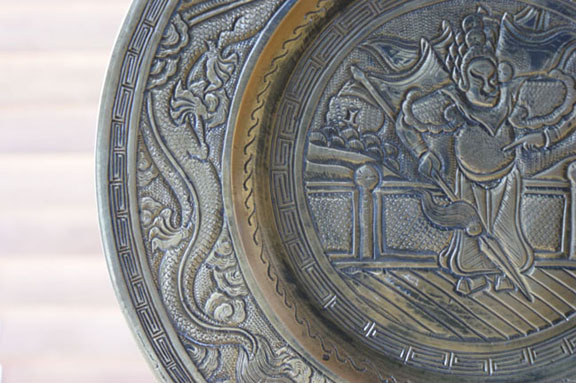 Subject:Re: Chinese Brass Plate, Export or Genuine Period? 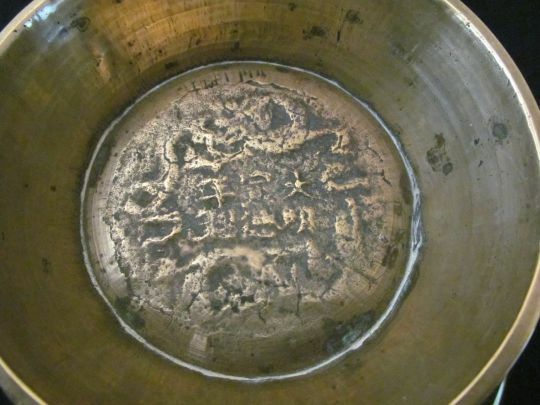 The apocryphal six-character mark on the base says 'Made during the Xuande Reign of the Great Ming Dynasty' (1426-35) and has a flawed look around the fringes. 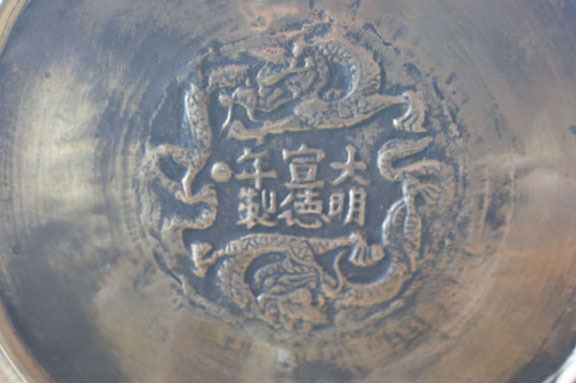 The motif on the other side, featuring dragons on the rim and a martial figure in the center, is stylistically similar to late Qing and Republic metal wares I've seen in the past, so may well have been acquired by your Grandfather at the time you've postulated. You may find authentic Xuande marks illustrated in major museum or auction house catalogs. However, I checked the Sotheby and Christie online archives and could only come up with a handful of Xuande engraved marks pictured in auction listings for period Buddha images. These have a different appearance from cast marks such as your plate bears. Bill, thank you so much for the information! We really do appreciate your taking the time to research and get back to us. I have a bowl with what looks like the identical marking on the base. Do you have any more information on this marking? My background on the subject of collectible Chinese brass and bronze is fairly shallow once I get past common areas shared with Chinese porcelain such as reign marks. If there are any online forums dedicated exclusively to this subject, I'm unaware of them. You may wish simply to search 'xuande' and 'brass' or 'bronze' in the archives of this forum to see what has been said in the past here. 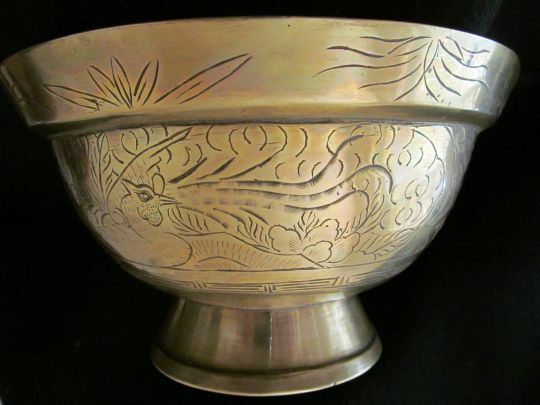 I have a bowl which think identical to Joe's, a wedding present to my parents 1930. Mum's uncle had upmarket china shop in London at Olympia. She also had relatives in E.I.C. but more likely from former. It has carved stand which looks Chinese to me. At 87, I am really interested in where this bowl would have been made.